“The banks have declared already that no redundancy of staff is expected from the introduction of computers”. The British computer firm Ferranti is chosen by Martins after successful demonstration of their Pegasus I computer. Programs are written and re-written, Pegasus II is born, and ordered for use by Martins. 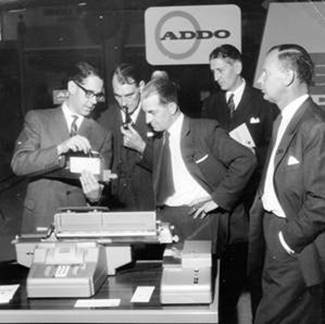 There follows the birth of the automation of branch accounting, travellers’ cheques, customer stationery, the notion of a computer terminal in every branch, AND the birth of the cash machine – In fact Martins unveils the World’s first cash dispenser to use a plastic card with a Personal Identification Number in the Autumn of 1967. 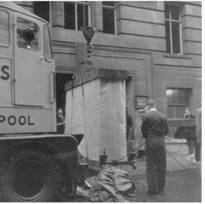 Following the success of the London pilot, a Pegasus II computer is installed at Liverpool Head Office in 1962, not before strike action at companies connected with Ferranti causes some delay to the project. Martins’ programme of automation is quite ambitious for a bank of its size, with plans to connect every branch to the computer centre by phone line to enable the daily submission of work recorded by each branch onto punched paper tape and fed through transmission equipment. That these plans never reach fruition is due in part to the merger, but mainly to Martins’ choice of computer equipment and its limitations as we shall see below. The following feature entitled “ENTER PEGASUS” appears in Martins Bank Magazine in the Spring of 1960, and gives the official version of the Bank’s decision to move into computers. Our bank is the first bank in this country to use an electronic computer for the complete current account book-keeping oper­ation including the production of statements for customers. 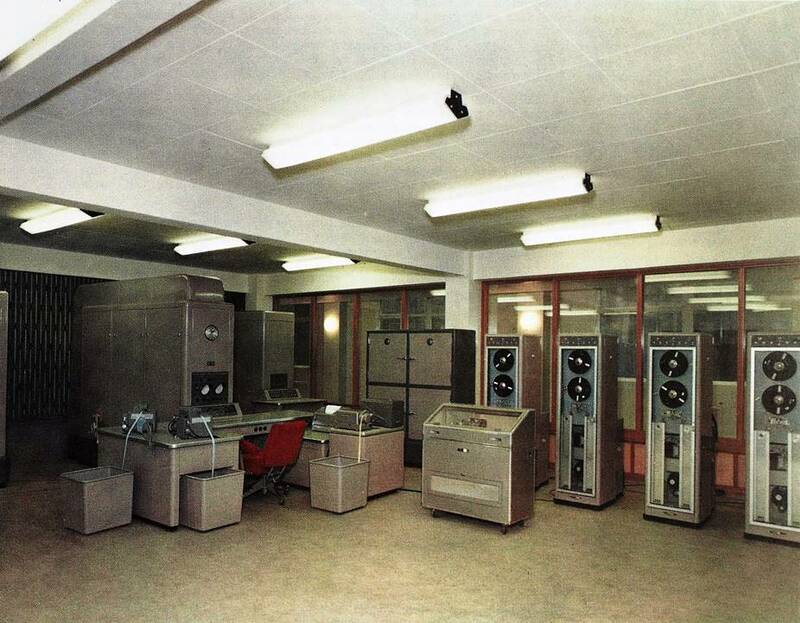 Here is the Pegasus computer manufactured by Ferranti Ltd. which was used for our experiment. Pegasus II can deal with 30,000 accounts in five hours with no more than five people in attendance. A room approximately 30 x 20 feet would offer ample accom­modation for the units shown here. 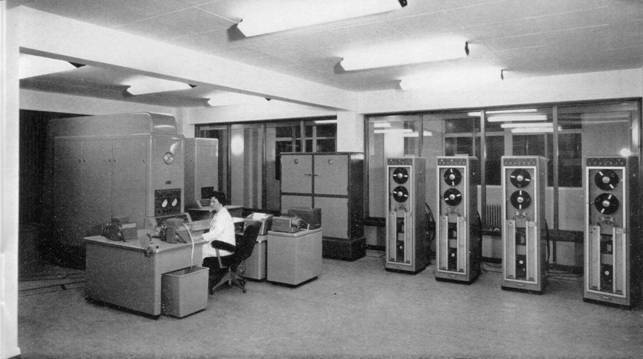 The actual computer is in the foreground on the left and there are four magnetic tape units, two of which face the camera im­mediately adjoining the actual computer. 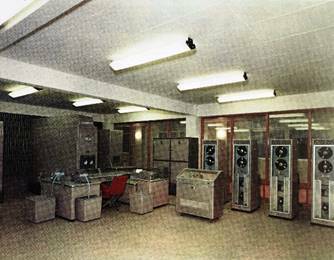 At the rear can be seen the power cubicle in front of which are the two other magnetic tape units. 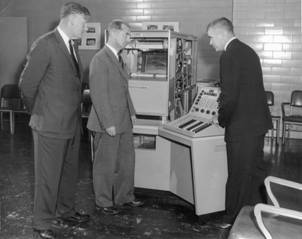 On their immediate right is the high speed punch, and adjoining it on the far right is the magnetic tape control unit. The introduction of electronic techniques into banking routine has been talked about for some time but to the majority of members of the staff no doubt this has been a prospect of the distant future likely to affect the next generation of bank staff rather than the present. The announcement that the Bank has ordered a computer and that delivery is expected no more than twelve months hence may have come as a rude shock to some who have prayed that it would not come in their time. Computers were heralded by the popular press a decade ago as the electronic brains that would revolutionise life in the future. This is the kind of sensationalism on which newspapers thrive but the devices of that time were not quite so clever as such accounts would have had readers believe. They were certainly of little use to commercial enterprises and the Bank's interest was merely academic. 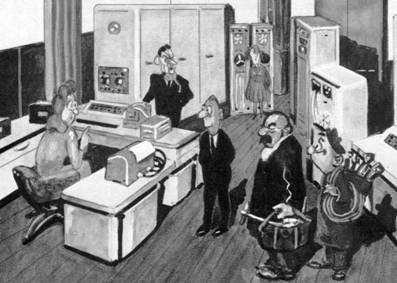 By 1955 it became clear that electronic developments applicable to com­mercial projects and particularly to banking were on the way and during that year the London Clearing Banks set up an Electronics Sub-Committee. Our earlier interest permitted Martins Bank to play its part in this inter-bank Committee from the beginning, providing a member of the Working Party of three. The Committee and Working Party are still hard at work and our independent work is not in any way in conflict with the joint research; indeed one is complementary to the other. For the next year or two our efforts were almost completely identified with the inter-bank effort but subsequently more and more attention was paid to the Bank's own needs. Only in very broad principle is the inter-bank Committee interested in accounting procedures and it was quite clear that it would be left to individual banks to develop the details of their own systems. Con­sequently the Bank opened discussions with all major computer manufacturers and this culminated in the development of what was called the First Assessment of Computer Specification for Martins Bank Limited which was distributed to interested manufacturers in March, 1958, along with speci­men data relating to a group of branches. On this basis " Feasibility Studies " were carried out, our own research staff co-operating extensively with the staffs of manufacturers. Visits to the U.S.A. and European countries provided extensive and valuable experiences to support this effort. By September 1958 the first Feasibility Study was complete and many more followed in the ensuing six months. Amongst these was the study produced by Ferranti jointly with our own staff based on the Pegasus computer and this appeared to stand out as the one most likely to satisfy the Bank's needs. A feasibility study is no more than its name implies. It is a study of the specification of a computer in relation to the task to be set, involving an estimate of the speed of operation that can be expected on such a task, the capacity of the equipment in terms of the amount of work that it can cope with and the probable economies of operation. A computer is not a fixed unit as is the case with an accounting machine; it is an assembly of component parts with almost unlimited permutations and combinations. The feasibility study aims amongst other things at assessing which particular units should be adopted for a given purpose. This stage of theoretical study is essential because one cannot buy a computer just to try out as one might an accounting machine. Many potential users will buy a computer on the basis of a feasibility study but this can be a risky procedure as many have found to their cost. Instead of taking such a step the Bank decided that the ideas and systems evolved during the study phase should be tested out by practical experiment and in April 1959 authority was given for an exercise involving one of our branches aimed at carrying out the whole of the current account operation by electronics in parallel with normal operating of the branch accounts by conventional methods. A computer requires a programme of detailed instructions on which it is to act. There is no single correct programme to be produced with mathematical accuracy. On the contrary, there is a variety of logical approaches to the programme and different programmers may produce quite different end products which nevertheless lead to the same ultimate result. There is scope for individuality. A good programmer is at least equal in importance to a good computer. Quite commonly up to two man-years is spent in studying an operation and programming it for a computer. The Bank, fortunately, could call on a good programming team provided jointly from our own staff and Ferranti and the work was completed by the end of the year after only eight months' work. This was in fact the target that had been set when the exercise was begun. The resultant programme proved to be very successful. Computer time was booked at intervals to test parts of the programme as they were completed and the process commonly known as "de-bugging"—the elimination of flaws in the elaborate logical structure of the programme— went through smoothly and quickly. This is the hallmark of good programmers. Finally the whole process was strung together into one complete programme and was then ready for practical testing. Meanwhile the branch end of the operation had to be prepared. 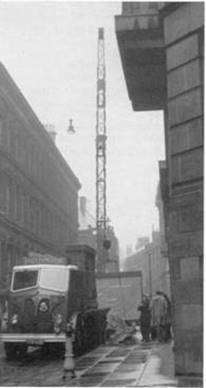 South Audley Street branch was chosen because it is near to Portland Place where the computer used for the experiment is situated and because the research staff were housed in that branch. The branch is not so large as to be unwieldy but nevertheless provided a reasonable sample of current account business. The first step was to give numbers to accounts. This is no simple process. Each number has to be computed so that it is self-checking and for this purpose the computer itself was used. Numbers have to be allocated so that accounts are substantially in alphabetical and also in numerical order, leaving gaps for new accounts. Then the co-operation of customers was sought because these numbers had to be printed on all cheques before issue to the customer. A machine was provided to imprint each cheque, with the name and number of the account-holder. This operation of personalisation was carried out each time a cheque book was requested and customers helped by bringing in their partly used cheque books for personalisation. The medium used to feed data into the computer is punched paper tape. 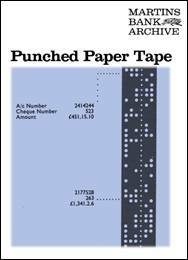 An adding machine had to be provided at the branch to produce this tape simultaneously with a normal adding operation. The first machine tried was not very satisfactory for our purposes but we were able to persuade Addo, a Swedish firm, to hasten through their workshops a prototype of a new model not yet in production and this was used for the exercise. Each day the work of the branch, after passing through the normal waste process, was handled a second time by an operator on the Addo machine to produce the necessary tape and also a print on an ordinary waste sheet. In January we were all ready and for the first time in this country the current account work of a branch was operated day by day on an electronic computer. It was on the basis of this exercise that an order has now been placed for our own computer. The exercise will not end with the operation of current accounts on the new equipment. Already other aspects of the Bank's routine are under consideration for application to the computer. This is the beginning of a new and exciting era in the development of bank methods. The Bank has clearly indicated that, far from lagging behind, it intends to point the way. The exercise has served its purpose and has been closed down. Now we are faced with a year of intense activity in preparation for our own computer. 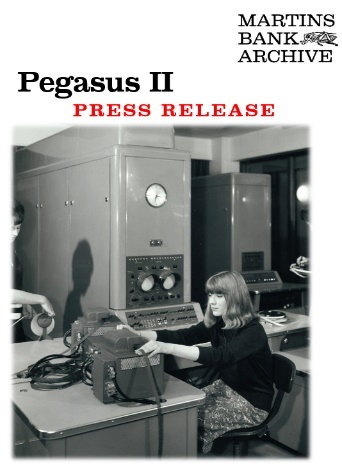 The Bank’s “Brave New World” introduction to Pegasus certainly gives the idea that exhaustive testing makes a computer operation foolproof, and the various stages of recording the data should be smooth running and simple to achieve. 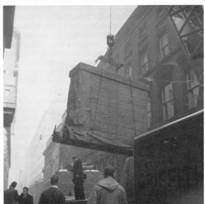 Here comes the “BUT” - As we have already mentioned in our MARTINS’ FIRSTS section, the race to be first with computers begins when another bank opens a drive through branch right under Martins’ nose in Liverpool. Ferranti sell Pegasus as a general purpose computer, and it is already in use at I C I in Manchester a year or two before Martins order one of their own. We are immensely grateful to our colleague Peter Hayes, who actually worked with the data collection for Pegasus at our Liverpool Heywoods Branch in the early 1960s, for the following recollections. As you will see, it certainly was not “plain sailing” and Peter’s story also gives us what might be another, albeit undesireable first for Martins – “Rubbish in, rubbish out”…. “I had a lot to do with the Pegasus Mark 2 which I had to make work whilst at Heywoods branch but it never did work properly. My recollection of the computer is of two accounts. A Shipbuilders (who at the time were laying down the keel of the Ark Royal) and a sweet and tobacco shop owner. The account numbers had to be preceded by a large number of zeros, as at this time there was no zero suppression and ALL leading zeros had to be entered for the computer to be able to accurately record the transaction against the correct account. So the young girls who each day produced the punched paper tape for inputting into Pegasus had to type all these noughts followed by a seven digit account number for each cheque or credit. 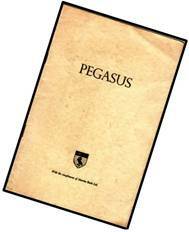 In Spring 1961, R Hindle Manager (Organisation Research and Development) writes a detailed report for Martins Bank Magazine to show staff what Pegasus could do, and why the whole project is necessary. It is fascinating to note from the first few lines of Mr Hindle’s article, that he seems to be advocating the installation of computers as a more reliable replacement for WOMEN, as computers are not likely to want to work for only a few years before leaving to get married! Many members of the staff, their daily work flowing easily and smoothly, must query the reason for radical change in the Bank's methods, whilst those who are labouring under an apparent overload of work resulting in long hours generally see as the logical solution to their problem an increase in staff rather than a change in system. The fact is that, in banking, profits are made from the holding of monetary balances and not from movements of money from place to place, but it is the movement of money that gives rise to the continually increasing load of routine work which engages the greater part of the Bank staff's man hours. To recruit staff in proportion to the increase in routine work would be to reduce the chances of a satisfactory career to those incoming members of the staff and this is not likely to encourage satisfactory recruiting. More purely routine staff who would have no expecta­tion of a successful career could be employed—and of course generally these are girls the majority of whom simply want employment for a few years until they leave to be married—but there is considerable competition for the services of available people in this category in many areas and organisations depending on large numbers of them can find themselves in a very precarious position. The start of something big often means a grand entrance, and equipment that is designed to control in excess of 30,000 current accounts requires a special room of its own, Liverpool Computer Centre at Derby House, close to Martins’ Water Street Head Office. Just like moving a piano: Every care is taken to ensure that each piece of the delicate and futuristic technology is handled with care and great skill by those who operate the crane and other lifting equipment. In 1932 conventional mechanisation was just beginning to spread and consequently forms an interesting basic year for comparison purposes. Since then postings to customers' accounts have increased by 160%. The increase up to 1947, just after the war, was only 50%. Note that these figures represent the increase in numbers of postings, not of the sterling value of the entries. So it appears that since the end of the war the Bank has added to its routine load more than its total commitments in 1932. There is no reason to think that this expansion of normal banking services is at an end. Indeed, new factors are appearing which are likely to increase the expansion rate. For instance, the credit transfer development has just been extended to include "third party" credits and one estimate puts the figure for credit transfers likely to be handled by the clearings in a few years' time at 400 million per year. This compares with the present cheque load of around 900 million per year. The possibility of extension of the principle of paying wages by credit into a banking account will bring more people into the banking circle. Mechanisation has helped the Bank to cope with increases and conventional mechanisation continues to be extended. The effect of mechanisation has been twofold. Firstly, it has introduced to the Bank a section of staff with a high natural wastage rate, members who are not likely to compete for the more responsible jobs. Secondly, it has increased the capacity per member of staff to deal with routine work so that numbers of staff do not have to increase in proportion to work increase. point had cost hundreds of man hours in manual procedure. A computer has quite a different effect. It is not merely an aid to production, a tool in the hands of a human being: it can take over from human beings complete routine tasks and requires only a very modest degree of human supervision. Before it can start on such a task, however, it must be provided with human guidance in intricate detail. Such guidance is called a programme and as a result of the need to produce such programmes important and responsible new posts are created. First, "Systems Analysts" study the purpose of the operations to be carried out in great detail and decide how best the computer can tackle the job. They build into their system techniques which were quite impracticable by conventional methods but which will be of great assistance in managing the affairs of the Bank. The shorthand of the Systems Analysts' trade is the flow chart which represents their thoughts in pictorial form. The flow charts then pass to the Programmer or coder, who reduces the charts to apparently meaningless lists of numerals which represent, in fact, the way in which instructions can be given to the computer. The people who are performing these new duties are all drawn from the ranks of our own staff. A new department has been set up to deal with "Organisation, Research and Development," including the task of programming the computer, but the purpose of this Department is not solely related to electronics. Its personnel must approach each problem with an open mind, and must weigh up the virtues of different methods, electronic and otherwise, before deciding how a job should be tackled. And now a progress report on the exercise to introduce Pegasus. Premises adjacent to our Head Office building in Liverpool have been obtained and have been modified for this purpose. The computer is expected to be installed and commissioned by the time this Magazine appears. A complete current account programme was written by our staff in co-operation with Ferranti, the manufacturers, during 1959. The task took nine months and in January, 1960 was given an exhaustive test. 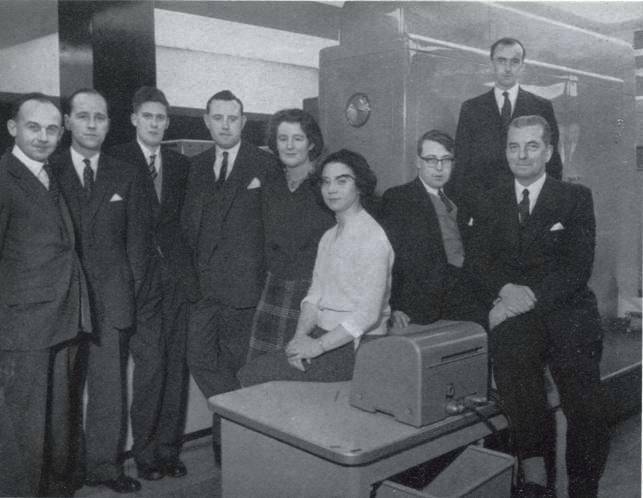 Our South Audley Street branch proved to be a very willing guinea pig; their accounts were applied to the computer and each day the branch produced a punched paper tape bearing details of entries passing through their books. The exercise was then closed down and the programme has since been completely re-written in the light of the experiences during the exercise. A larger team has spent ten months on the re-writing of the programme though this period includes the training of new members of the team. There is no one correct programme for a computer operation; a programme is in fact a growing thing reflecting the personalities of those working on it and it will continue to develop as time goes on until optimum results are achieved. In the early stages the programmers will operate the equipment, for they must ensure the successful application of their work, but meanwhile a team of operators will be trained to take over. The need for programmers will continue after installation for re-programming work and also they will have to turn their attention continually to new applications as the scope of the computer extends, perhaps, to travellers' cheques reconciliations, to Trustee, Registrar's, Overseas and other depart­mental accounting problems, and to a whole range of statistical work. In the first place the computer will work on current accounts, for which operation it has a capacity of 40/50,000 accounts. Clearly this requires the centralisation of the routine of a number of branches and this involves problems of communication. The Bank has experimented already with a system of data transmission over G.P.O. telegraphic circuits and is now studying methods of higher speed communication over the ordinary telephone line network. The first objective, however, is to centralise branches in a compact area around the location of the computer providing about half the total capacity of the computer. Under these circumstances communication can be handled quite satisfactorily by means of porters who can physically transport data through the streets. (Chief Programmer in charge of the project) and Mr R Hindle. The computer will be programmed to deal with all aspects of current account book-keeping, including:— (1) Posting of normal debit and credit entries, e.g., details from cheques, credit notes, etc. (2) Incorporation of corrections to normal entries. (3) Alteration of account information. (4) Addition of new accounts. (5) Removal of closed accounts. (6) Accumulation of statistics for management information, interest charges, etc. (7) A check of each debit entry against a list of stops. Any stop so found is rejected by the computer. (8) Comparison of the closing balance of each individual account or group of set-off accounts against overdraft limits. Any excess of these limits causes control information to be printed out, drawing attention to the excess. (9) Printing of customers' Statements. Most of these are produced on a period basis agreed with the customer but provision is made for Statements to be obtained outside this standard requirement by special request. (10) The accumulation through the day of the following branch statistics which will be printed out and returned to the branch—(a) A daily list of balances, debit and credit, of all accounts, (b) A daily audit sheet providing details of any items rejected by the computer, balancing figures and any other item requiring further attention by the branch. (g) accumulated statistics for management Information and the computation of charges. (e) date, description and amount of each posting awaiting print out on the next statement. Both these files need to be updated each day in respect of the vouchers passing through the branch and it is therefore necessary to transcribe the relevant details from the vouchers on to a suitable medium for the computer. Paper tape is used for this input medium. Preparations have already been made at one Liverpool branch, and others are following. This involves the numbering of accounts for purposes of internal identity. Cheques are already being "personalised," i.e., printed with account name and number, before books are issued to customers. The traditional ledger posting machine has a threefold purpose, i.e., (1) Arithmetic processes have to be carried out to produce new balances and adjust statistics. (2) Historic purposes require the assembly of entries in chronological order. (3) A visible record of (1) and (2) has to be produced. A fourth process, the production of statements, exists in conventional systems generally as a separate operation but the three purposes above are combined in a single process. For electronic operation, however, the above three purposes are dealt with in separate processes. The complete daily sequence of events is as follows: - All vouchers entering the branch must pass through one of two listing operations - the In-clearing or the Waste. By adding a paper tape punch to a conventional adding machine the paper tape input for the computer is being prepared as a direct by-product of the normal listing function with little additional effort. Details (account number, simple description and amount) from each voucher relating to an account in the branch, are keyed into the machine and, on depression of the motor bar, are printed on the machine list and simultan­eously punched on to paper tape. At intervals check totals are punched into the tape. These check totals are used by the operator to check her entries on the machine and also by the computer for checking the data on input. It will be noticed that by this method no vouchers ever leave the branch office. The Pegasus system has powerful automatic checking features and the automatic checking of every operation guarantees correct processing. Before each computer process commences, the computer automatically checks the arrangements made manually by the operator. It checks that control switches are in their correct positions and that the correct magnetic tapes are mounted on the computer. There is no doubt that this book-keeping system has a far higher degree of safe­guard against errors than any system that can be visualised using conventional equipment. Banks are looking towards the use of automatic voucher handling equipment which can actually read the cheques and other vouchers for itself. Special character forms, slightly different from the Arabic Numerals with which all are familiar but nevertheless quite readable by human beings, are to be used for this purpose. New bank and branch (i.e., "National") numbers have been worked out and these will be the first to appear on our cheques in the special numerals. These automatic readers can sort cheques and also can feed a computer direct without the need for paper tape. In due course Pegasus will be able to work with such machines. The expected time-table is for installation in March when the work of Heywoods branch, Liverpool, will be operated by the computer in parallel with normal work, Heywoods could well be dependent on the computer by May. Castle Street, Church Street, Victoria Street and Liverpool City Office (probably in that order) will be transferred during 1961 and then we shall probably pause to take stock and to consider alternative applications. The banks have declared already that no redundancy of staff is expected from the introduction of computers. Clearly, immediate plans will not reduce the need for managers, specialists and cashiers who will still be needed to carry on the work in contact with customers without material change. Machine sections will contract, of course, but normal wastage will take care of this; indeed it has become increasingly difficult to maintain the staffing of these sections. Operational teams will be needed for computers, and these will be drawn from the ranks of present machinists. Branches will have a need for supervisory staff and this, as well as more opportunities on the counter and in specialist posts, will increase the opportunities of those girls who want to serve a career in banking. Men also will find the new banking structure more attractive, with accelerated training towards responsible posts at a much earlier age than heretofore. Society is subject to a continuous process of development and banks must develop services in step with the needs of society. Some may regret the passing of the "good old days" but they cannot bring them back. Individual banks must now face up to competition not only from inside the banking system but also from outside, from hire purchase concerns, from savings banks, from the Post Office (which might even introduce a payment system similar to the Continental "Giro") and from the growing interest on the part of the public in direct investment. The staffs of banks have a personal stake in the success of bank operations, for from them they get their own bread and butter—and not a little jam. The answer is fewer staff per unit of work. Experience in mechanisation indicates, however, that the bulk of work to be handled grows faster than the increase in efficiency that results and consequently the overall numbers of staff does not fall. The co-operation of all the staff is necessary to ensure the success of the new ventures. Only they can sell it to customers. This is not to say that customers will necessarily be subjected to an inferior service. They may lose in detail in the initial stages, but in the long run they also will gain. In due course extra services can be offered, such as reconciliation services in addition to a mere statement of entries passed, or even an accounting service for the small trader. There will certainly be the possibility of the bank accepting the extra work of the future without the need to levy high charges to cover steeply rising costs. Thus we are confident that the new developments will turn out to be for the benefit of the Bank, its customers and also the staff.